The Pacific Coast starts at the sharp tip of the broad arrowhead that is Cape York Peninsula, just 1200 kilometres from the Equator. The area is pretty damp from November to April which is why it’s a really popular trip for 4WD during the dry season. The 1000 kilometres shoreline between Cooktown and Cape York is one of Australia’s greatest wilderness coasts. The contrasts in coastline are particularly dramatic near the tip. In the northern part of Cape York the rivers end in a maze of coastal lagoons, mangrove swamps and a series of beach ridges covered in vineforest. Saltwater crocodiles are common in most estuaries. During the height of the wet season floods, stingrays, sawfish and sharks venture up the rivers and have been seen many kilometres inland. When the rivers dry up the bull shark is often stranded. The Great Barrier Reef extends from Cape York down to just north of Bundaberg. Washed by the warm waters of the south west Pacific is the world’s largest system of coral reefs. The Great Barrier Reef has more than 3400 individual reefs and stretches 2300 kilometres. The coastline has many islands that are very popular with holidaymakers. Cloud capped mountains, carpeted in steamy jungle and towering over narrow, coastal lowlands, bring scenic grandeur to the Atherton Tableland. The famous Daintree National Park is here but the area is also home to Bellenden Ker and Palmerston to name just two. Cairns and Port Douglas are the most well known towns. Central Queensland, sometimes called the Sugar Coast, straddles the Tropic of Capricorn. The most northerly surf beaches in eastern Australia are situated at the base of the Great Barrier Reef. South Eastern Queensland from Fraser Island to the New South Wales border is highly developed with many facilities for holidaymakers and those seeking a lifestyle in the sun. The Sunshine Coast’s lush verdant terrain is home to Steve Irwin’s Australia Zoo. The beaches along this entire stretch are simply fabulous. The scenery in the hinterland is simply glorious and has many towns with vibrant shopping and night life. Next is the sprawling and vibrant city of Brisbane which basically links the Sunshine and Gold Coasts. The Gold Coast is a tourist mecca and has many attractions guaranteed to empty your wallet or put a dent in your credit card. Movie World, Wet n Wild, Sea World, Dream World, Fleays Wildlife sanctuary, iconic beaches and high rises. Across the border to north coast New South Wales also has some fantastic beaches and fortunately less crowded. Byron Bay is a hot spot since the influx of its more famous residents. The sleepy little town with dirt roads and alternative lifestylers have been replaced. Lots of shops, paved roads, expensive housing and upmarket citizens. Very busy on weekends. Moving on down the coast, there’s Lennox Heads, Ballina, Grafton and the hugely expanding Coffs Harbour laying claim to famous faces such as Russell Crowe, Wendy Matthews, Jack Thompson, David Helfgott. The shopping facilites in this town have blossomed. Port Macquarie has also boomed and is now home for many retirees. The waterfront has been developed to cater to the tourist influx. The Port Stephens area down to the Central Coast is very popular for weekends away from Sydney. The mass exodus occurs every Friday afternoon on the freeway north of Sydney and bottlenecks again on Sunday afternoon. Nelson Bay is a town of many apartments all boasting great views. The city of Newcastle is a very busy port with as many as 100 vessels anchored offshore at any time waiting to unload. The Hunter Valley is well known for wine, perhaps more so than grapes. Just 2 hours from Sydney and you will find yourself amongst the tranquility of vines. Pokolbin shopping centre is a good place to stop for the icecream and the chocolates and the cheese before heading out to any of the vineyards. For a fantastic 360 degree view go to Audrey Wilkinson. The oldest vineyard, Tyrrells, conducts a memorable tour. Lake Macquarie is a body of water 4 times the size of Sydney Harbour and is tucked away about 30 minutes south of Newcastle. It is a boaties paradise. The South Pacific ocean rolls right up to Sydney’s doorway and presents itself on the sandy beaches of Bondi, Whale, Palm, Coogee. Sydney is quite simply a stunning city to fly into and if you can find the time to ride a ferry or take the water taxi and get out on the harbour you will really be rewarded. 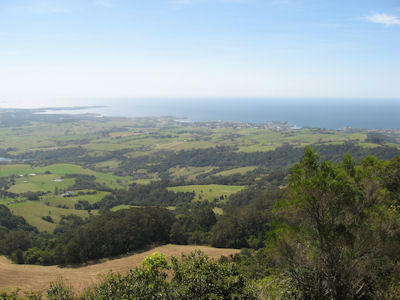 Beyond the outskirts of Sydney’s urban sprawl and its green buffer of national parks, the south coast is sandwiched between the hills and the sea, 380 kilometres to the Victorian border. The area is hugely popular with land locked Canberrans. It was the first area to be examined in detail by Europeans. Travel Grand Pacific Drive for a ride out over the ocean north of Wollongong. Then it’s on to the lush green hills around Kiama before heading down to historic Berry . In contrast to North Coast NSW the southern beaches are generally small with more individual character. The village of Batemans Bay has grown enormously and is now the hub of beachside entertainment for the ACT. South of Batemans Bay there are villages at regular intervals all the way to the Victorian border. This entry was posted in Pacific Coastline. Australia is a big old island that is also a continent. Our golden sands are washed by the Indian Ocean, The Southern Ocean, The South Pacific Ocean, Timor Sea, Arafura Sea, Coral Sea and Tasman Sea. On this site we have divided the country according to which ocean caresses the shore. Indian Coast (Indian Ocean), Southern Coast (Southern Ocean), Pacific Coast (South Pacific Ocean), Top End (Timor, Arafura and Coral Seas) and the Apple Isle of Tasmania (Tasman Sea). This map shows rainfall averages and highlights the dry interior also called The Outback. I am a 3rd generation Australian of English/French/German heritage who has travelled to a number of European, Asian and North and Central American countries. The best part about experiencing different cultures and countries is coming home. Our island home is sunny, warm and comparatively quiet. It's a great place to live and I have lived most of it!